This badge was issued to Heathcliff Rongo on 15 Apr 2018. 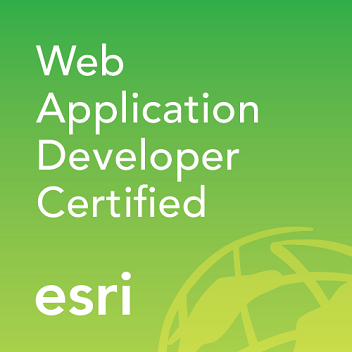 Earners of the Esri ArcGIS Web Application Developer Associate certification have proven experience with ArcGIS Web development applications and ArcGIS concepts. Earners will demonstrate proficiency with using ArcGIS technologies to build web applications with object-oriented programming, application documentation, maintenance, performance, and implementing client-side and server-side security, and with Esri's ArcGIS technologies and best practices. Take and pass the Web Application Developer Associate certification exam.